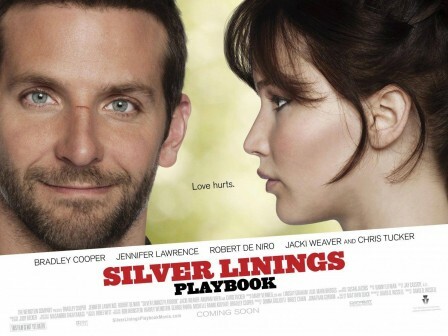 Silver Linings Playbook | What is Ann Watching? I went to the theatre to see this quirky romantic comedy. It was directed by David O. Russell and is about two abrasive characters with mental health issues. My husband and I really enjoyed it, but it isn’t a film for everyone. I am a fan of the main leads, Bradley Cooper (ever since he was Will on Alias) and Jennifer Lawrence (awesome in Winter’s Bone) and was impressed at their nuanced performances. In their portrayals of damaged characters, they are worthy of the Oscar nominations that they have received. Robert De Niro as Cooper’s dad is just icing on the cake. Cooper plays Pat, a man who has just been released from an 8 month stint in a mental hospital into the care and supervision of his parents. He was hospitalized rather than jailed after he walked in on his wife and her lover went berserk and attacked the other guy. He is completely non compliant in his rehabilitation and still holds onto the hope of reconciliation. Shortly afyer his release, he meets his buddy’s recently widowed sister-in-law, Tiffany (Lawrence) and recognizes someone as off as he is. She manipulates him to help her out as a dance competition partner. From there we watch an interesting relationship and awkward dance routine develop. Because the plot is pretty trite when reduced to it basic narrative, the strength of the movie hinges on the lead actors. A special shout out goes to Chris Tucker in a great supporting role as Danny, Pat’s institutionalized buddy. These characters are difficult people to like. Their family’s obsession with the Philadelphia Eagles football team is beyond my comprehession. However, if one has ever had to deal with someone close with serious mental health issues (it is surprising how many of us have), one knows how on the nose these nuanced performances are. I found them moving and at times, too close to home. I also enjoyed Jacki Weaver as Dolores, Pat’s mom and Pat. Sr.’s (De Niro) wife. Her silent expressions spoke volumes as she stood as go between for two irrational men in her life. The apple didn’t fall far from the tree, I’m afraid. This is a film about people I could not stand spending much time with on a day to day basis. They are difficult to get along with in their delusional obsessions and self destructive behaviours and besides, I can never get into sports that much. For this reason, this film may not have a broad appeal. So the fact that I really enjoyed it and found myself pulling for this couple is a conundrum that I haven’t yet been able to explain. This film is not free of Hollywood cliches that plague the romance genre. By the time I got to those moments, enough good will has been established to make them forgivable. If you like nuanced performances of damaged characters, awkward dance numbers, sports fanatics and/or quirky romances, you may want to check this one out.